I took ‘Minnow’ for a trial run on her road trailer as far as Hullbridge. There, at the public car park, I practised reversing. I found manoeuvring more difficult with ‘Minnow’ than with my West Wight Potter. ‘Sandpiper’ sat further back on her trailer, so that I could see where she was going. ‘Minnow’ completely blocks my view. That means I shall have to make sure the trailer and car are centrally lined up at the top of a slipway, and when reversing keep them in line – that’s easier said than done! Because the tow bar is short, I’ll have to lower the boat and trailer into the water with a rope attached to the car’s tow ball. A single turn around the tow ball will be sufficient for controlling their descent. Another way of launching is to chock the trailer wheels close to the water; then unhook the trailer, but before doing so, make sure the forward end is heavy enough to keep the jockey wheel in contact with the slipway. 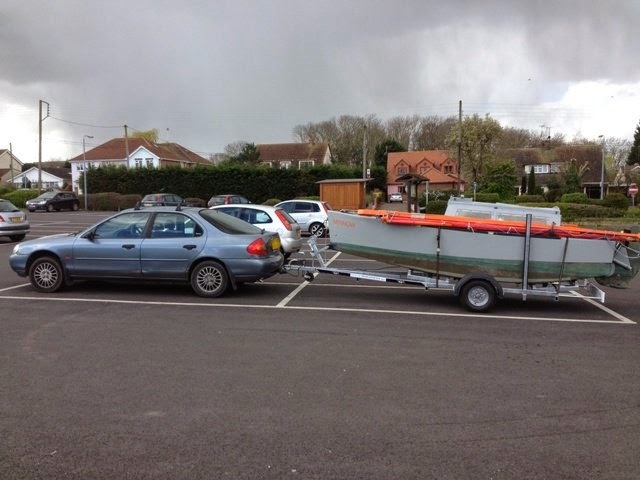 Drive up the slipway; then link the trailer and car with a piece of rope. Drive a few inches further so that the chocks can be removed. Slowly reverse until the boat floats off. Secure her with her painter to a convenient fixture; then retrieve the trailer by towing it clear with the rope. A long tow bar makes a lot of difference, because the whole procedure is simplified – just reverse boat and trailer into the water until the boat floats clear. 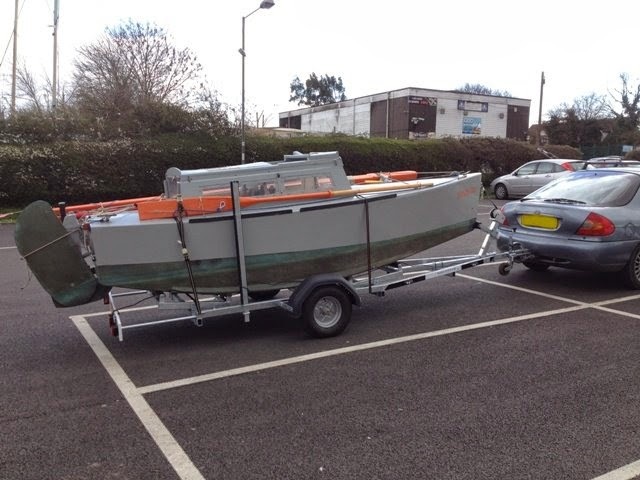 Secure the boat with her painter; then drive up the slipway with the trailer still attached. Sean Mulligan with his Paradox, ‘Scout’ does this with comparative ease. When I reverse mine I can't see either trailer wheel in the wing mirrors. This is good because it means you're going dead straight. As soon as a wheel starts to appear in either mirror you just need to turn slightly to move it out of sight again. It's a simple way to reverse straight backwards. I have to reverse Johanna up into our sloping driveway (I'd never be able to push her)off the road. I have less than 6" clearance to get her through the car port but can manage that with just using the mirrors. It was a bit stressful the first few times (with build up of traffic on the road) but it gets simple the more you practice. Thanks for the tip. I'll give it a go.